Cross-section of a red oak tree cut on Mount Monadnock, February 6th, 2018. Count the rings back to the previous timber harvest done by the Forest Society in 1990. Did the tree's growth rate increase afterwards? In February of 2018, the Forest Society began a harvest on the western side of Mount Monadnock. The goal of this harvest is to cut high-quality red oak trees that have attained maturity and provide an opportunity for new oaks to seed in. The previous two falls have been oak mast years, and acorns are abundant in the understory leaf litter. Other seeds are present as well: white pine, red maples, several species of birch. All had strong seed years in 2017. 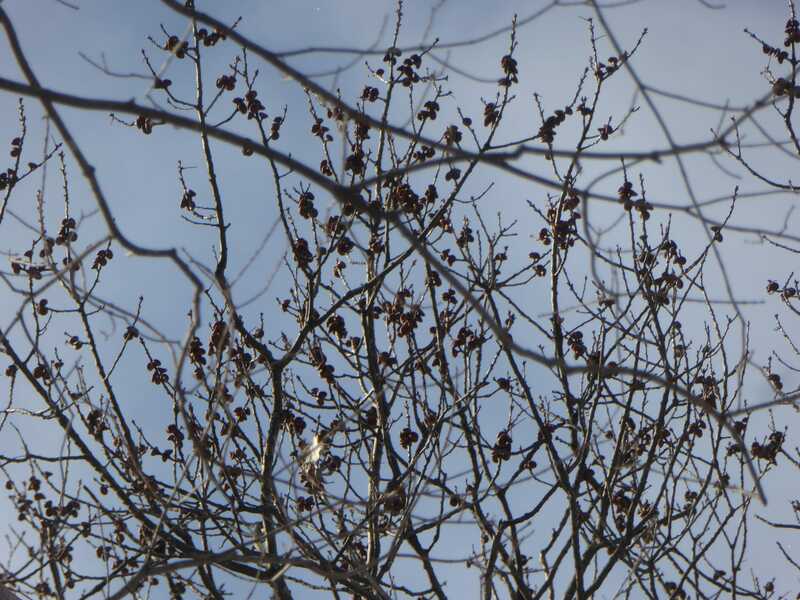 The goal of this harvest is to replace those oaks being cut with a new cohort of oak seedlings. Pines, maples, and birches will also likely be a part of the mix. 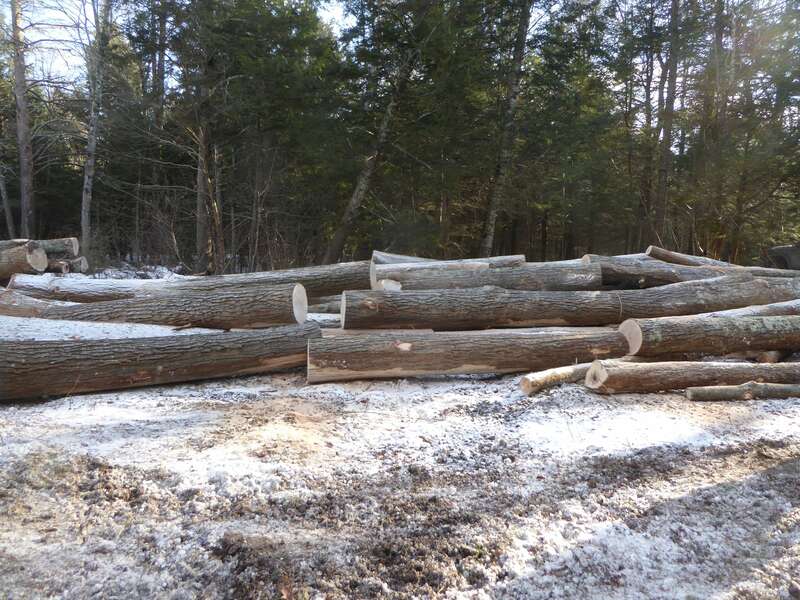 We’d like to continue growing red oak on this site, since the species has grown well in the past and red oak trees grown in the Monadnock region of New Hampshire produce strong and high quality forest products. The wood’s rich color makes it highly sought after, world-wide. Common uses for red oak include for stair treads, flooring, and veneer. The high quality red oaks trees that are being cut in this harvest didn’t grow there by accident, however. The story is one of careful, patient forest management. The year was 1990 and Forest Society forester Geoff Jones was out on the western flank of Mount Monadnock marking timber to be cut in an upcoming harvest. The forest was dominated by red oak and white pine of mixed quality. Some trees (mostly red oaks) were straight and healthy, with the potential to produce timber products. Other oaks and pines in the forest were crooked, scarred, or otherwise unhealthy; unsuitable for such esteemed future uses. Forestry is often compared with farming and uses some of the same terminology; the best trees are called “crop trees”. The forester’s goal was to favor these crop trees, providing them with ample growing space and access to water and nutrients. This type of harvest is called an intermediate harvest, in that the crop trees still have decades of productive growth ahead of them before they are ready to be harvested. It’s also known as an improvement thinning, in that by removing the poor quality trees you’re improving the overall quality of the forest stand. And so Jones walked the forest with his blue paint gun, marking the poorer quality trees for removal and leaving the better quality trees for retention and continued growth. Saving those trees for later. Twenty-either years after that initial intermediate improvement cut, the Forest Society is planning another harvest. That last harvest tended the crop trees, allowing them to remain healthy and grow strong and tall – it was without question a success! These trees that were saved for later are now ready to be harvested, milled, and used. But they will be harvested in a way that also attempts to accomplish the other goal of the harvest: regenerate more oak trees. The harvest will be a combination of patch cuts (think clear-cuts but somewhat smaller) and seed tree harvesting (picture a savannah with tall strong trees spaced widely). These two methods are aimed at allowing enough light to hit the floor to give any oak seedlings that sprout a chance to compete with other species that are more tolerant of shade such as beech, red maple, and striped maple. The Forest Society is working with consulting forester Jeff Snitkin to oversee this harvest. 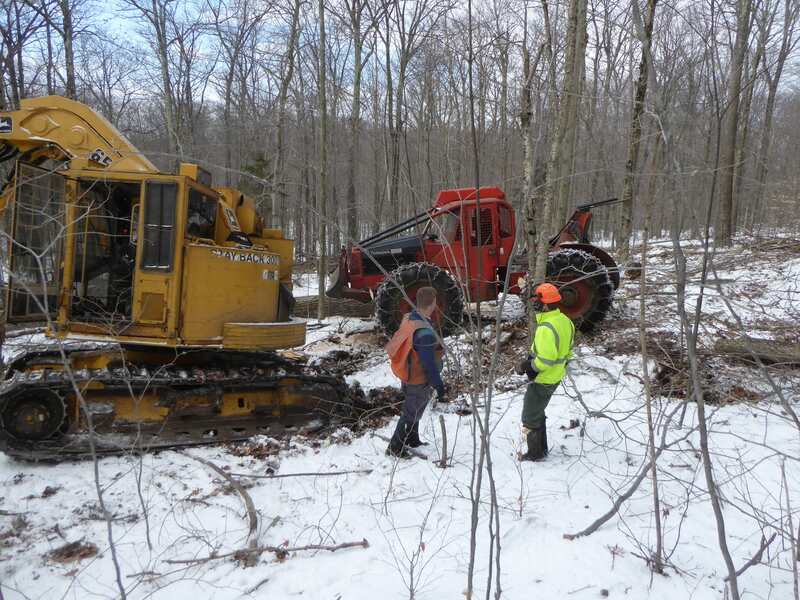 The wood has been sold to Cersosimo Lumber in Brattleboro, VT, and Wimmelman & Sons Logging has been contracted to get the trees cut and delivered to the mill. Interestingly, it was loggers from the Cersosimo sawmill who carried out the intermediate harvest in 1990. Establishing good long-term relationships is important in the field of forestry, and this is one example. This entry is the second of several that will be conducted on this part of Monadnock over the next couple years. In total, about 250 acres will be treated using a variety of silvicultural techniques varying from a light thinning to large patch cut openings. You can read about the goals and methods of the 2016-2017 winter harvest here. In considering these harvests, it is important to realize that the Forest Society owns over 4,500 acres of Mount Monadnock, including its summit. Of that acreage, almost 2,800 acres have been voluntarily set aside as an “Ecological Reserve”, where the Forest Society will not conduct any timber harvests for the foreseeable future. These areas will be left to naturally develop, free from human interference. This Reserve contains the sensitive, high elevation parts of the mountain and those containing unusual plants and natural communities. The lower flanks of the mountain, with forest types that are relatively common in New Hampshire, are those which will be actively managed. Indeed, a major goal of our management of these lower areas is to conduct regular timber harvests that create patches of young forest to complement the aging forests of the Ecological Reserves. The Forest Society has owned a part of Mount Monadnock since 1915, and we remain committed to the long-term, sustainable management of this precious and unique state resource. If you have questions about anything related to this harvest please don’t hesitate to contact us. We enjoy talking to people about thoughtful, sustainable forestry. This article will be updated with photos from the harvest after it gets underway. Stay tuned! 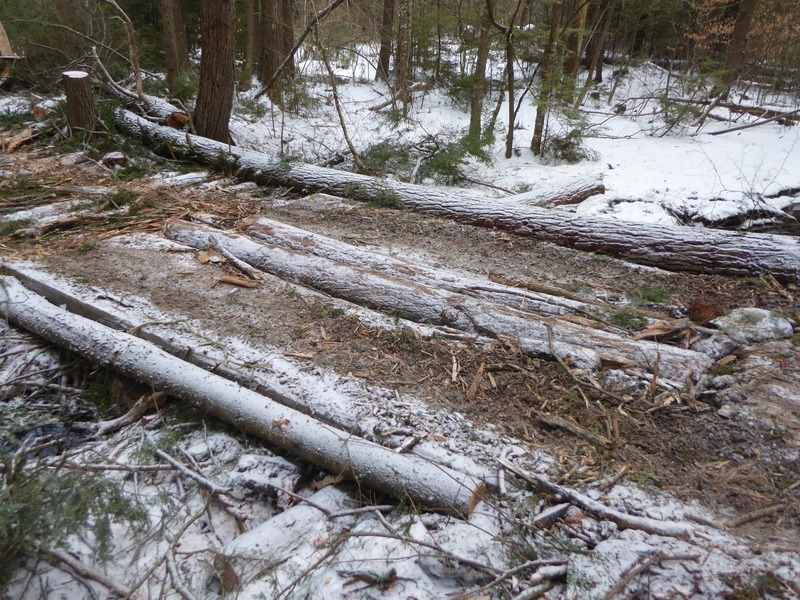 Two portable skidder bridges are used at each stream crossin to minimize impacts on water quality and wildlife. Red oak acorn caps on trees are evidence of the heavy crop from last fall. Hardwood logs on the landing are cut into sections to be trucked to Cersosimo Lumber's sawmill in Brattleboro, VT.